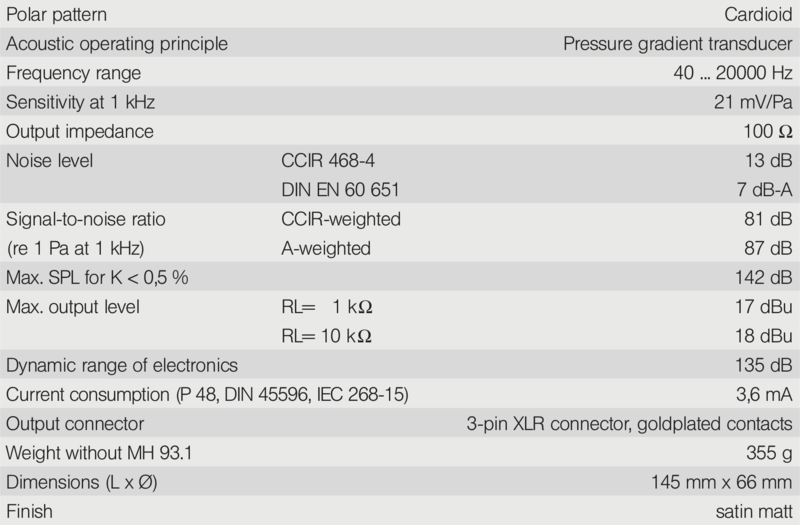 Large diaphragm FET cardioid capacitor microphone with selected M930 capsule. The M 1030 studio condenser microphone combines modern large diaphragm capsule technology with the latest in semiconductor circuit topology. Physically larger than it’s M930 cousin, the housing combined with selected M930 type capsule is optimised for large diaphragm vocal and instrumental studio applications and is specifically designed for professional and semi-professional users who seek uncompromising high performance. 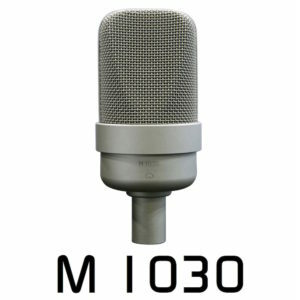 The M 1030 is ideally suited to universal miking applications in broadcast and sound studios. Applications include vocalists, announcers, dialogue pickup and as a spot microphone for recording guitars, keyboard, percussion, wind and string instruments. The microphone is side addressed, with the model number and polar pattern symbol marking the front of the microphone. The green light emitting diode (LED) inside the protection cage indicates that the microphone is ready for operation. The condenser capsule exhibits a smooth frequency response with a slight presence boost in the 8 to 14 kHz range. 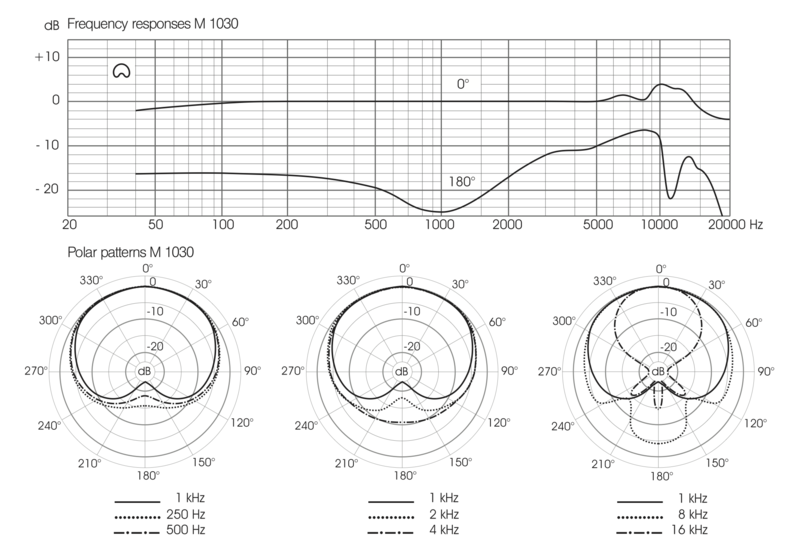 The polar response exhibits an exceptionally high degree of rejection for sounds impinging from the rear (cardioid). The electronic impedance converter uses a newly designed circuit topology. This design reduces the noise floor to an extremely low level whilst also raising the maximum output capability. As a result, this microphone produces a clean, distortion-free sound over a very wide dynamic range. The electronics involve some clever optically isolated powering technology, in which a high‑intensity LEDs, driven directly from the phantom supply, illuminate photocells which drives a DC‑DC converter. This innovative approach neatly isolates the capsule bias and impedance converter power rails from the phantom supply, which helps in achieving the very low noise floor. Susceptibility to RFI is very low. The capsule and electronics are elastically suspended inside the metal housing, effectively reducing sensitivity to mechanical impact and structure born noise. The EA 92 elastic (cats-cradle) suspension can be used in place of the MH 93.1 holder supplied by use of the A 93 adaptor to enhanced noise attenuation if desired. Connection is with a standard 3-pin XLR plug. The M 1030 requires 48 V phantom power conforming to DIN 45596 and IEC 268-15.